Virsto is a software defined storage solution which accelerates storage by intercepting all of the randomized I/O at the hypervizor level and writing them to dedicated write logs in a serialized format and later de-staged onto virtual disks on storage area networks (SAN). 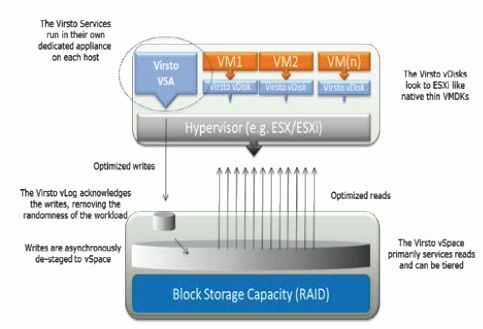 Virsto also optimizes capacity by provisioning each virtual disk as a thin disk. Virsto also supports Microsoft Hyper-V and Citrix XenServer. VMware acquired Virsto Software in February 2013. Since then no new releases or any other news came out. At VMworld there was a breakout session on Virsto software. At that time it became already clear VMware did not have the intention to continue developping Virsto software although this was not made public. The main reason for acquiring Virsto was probably the knowledge and skills of the software developpers working for Virsto. Virsto is using very nice techniques which enhances performance for snapshots & cloning. I am sure Virsto engineers were involved in developping VMware Virtual SAN, VMware View and they are probably (still) working on Virtual Volumes. The VMware posting can be read in total https://www.vmware.com/support/acquisitions/virsto.html.